Dissertation: In the Path of the Prophet: Medieval and Early Modern Narratives of the Life of Zarathustra in Islamic Iran and Western India. Awarded with distinction. Assistant Professor, Department of Near Eastern Studies. Assistant Professor, Department of History. Link-Cotsen Postdoctoral Fellow, Lecturer in the Department of Near Eastern Studies. Cosmopolitan Zarathustras: Religion, Translation, and Prophethood in Iran and South Asia. Draft manuscript completed. The Book of Zarathustra: Critical Edition and Translation of the 13th-Century New Persian Text of Kaykāʼūs b. Kaykhusraw b. Dārā and the 17th-Century Gujarati Text of Rustam Peśutan Hormazyār. Manuscript in preparation. The Pahlavi Book of Religious Judgments (Wizirgerd ī Dēnīg): Zoroastrian Religious and Legal Thought in the Early Medieval Period. Edition, Translation, and Commentary. Manuscript in preparation. There's No Tapping around Philology: A Festschrift for Wheeler McIntosh Thackston Jr.'s 70th Birthday. Edited with Alireza Korangy. Wiesbaden: Otto Harrassowitz Verlag. Published September 1, 2014. “Zoroastrian Scriptures in India.” With Prods Oktor Skjærvø. In Arvind Sharma (ed. ), Encyclopedia of Indian Religions, Springer Verlag, in press 2017. “Susa.” In The New Interpreter’s Dictionary of the Bible volume 5. Nashville: Abingdon Press, 2009.
Review of Christiane Reck, Berliner Turfanfragmente manichäischen Inhalts in soghdischer Schrift. In Journal of the American Oriental Society 129.1, 2009, 166-7. Invited participant in the Global Reformations: Religion and the Making of the Modern World Workshop, University of Wisconsin, Madison, May 6–7, 2016. Zoroastrian Kingship in Safavid Iran and Mughal India, Department of Religion, Stanford University, April 14, 2016. Universal Harmony (ṣulḥ-i kull) in Safavid Iran. Association of Asian Studies 75th Annual Conference, Seattle, Washington, April 1, 2016. Participant in the Persian Gulf: Past and Present rountable, University of Washington, November 12, 2015. Invited participant in the Political Theologies of Medieval and Early Modern Islam workshop, University of California at Santa Barbara, October 30–31, 2015. Harmonious Henosis: Āẕar Kayvān and Occult Aspects of Akbar’s ṣulḥ-i kull, presented to the 44th Annual Conference on South Asia, Madison, WI, October 24, 2015. Iran between between Xwanirah and Jambudvipa: Locating Zoroastrianism in the Sanskrit Cosmopolis, presented to the Sanskrit in Persianate India preconference, Madison, WI, October 22, 2015. Nativism and Prophethood in Early Modern Iran: Āẕar Kayvān and the Quest for Universal Religion. Presented at the Colloquium in Honor of Patricia Crone. Institute of Advanced Study, School of Historical Studies, Princeton, NJ, February 25, 2015. Living the Good Religion among Others: Cosmopolitan Zoroastrian Thought from the Middle Ages to Modernity. Khorshed Jungalwala Memorial Lecture. Presented at the XVII North American Zoroastrian Congress, Los Angeles, December 30, 2014. Sound in Body and Immortal in Soul: Zoroastrian Healing Traditions from Late Antique Iran to Modern Western India. Presented at the University of Iowa South Asian Studies Program Seminar, December 8, 2014. The Lord of the Planetary Court: Cosmic Aspects of Millennial Sovereignty in the Thought of Āẕar Kayvān and His Followers. Presented at the Middle East Studies Association 2014 Annual Meeting, Washington, DC, Novermber 23, 2014. The Language of Heaven in Early Modern Iran and India: Azar Kayvani Ideas of Speech and Cosmology. Presented at the 43rd Annual Conference on South Asia, Madison, WI, October 17, 2014. The Loss of the Persianate and the Recovery of the Iranian: On Parsi Antiquarianism and Modernity. Presented at the Yale "Persianate Studies: A Conceptual Inquiry" conference, New Haven, May 10, 2014. Caravan to India: On the Migration of Persian Free-thinkers in Mughal India during the Reign of Shāh ʻAbbās. Presented at University of Maryland "The Wide World of Persian: Connections and Contestations, 1500-Today" conference, Baltimore, May 3, 2014. Xwanīrah or Jambudvīpa? Theoretical Approaches to Zoroastrian Sanskrit and Old Gujarati Texts. Presented at the 224th Meeting of the American Oriental Society, Phoenix, March 17, 2014. Participant, Princeton Islamicate Occult Sciences Workshop, Princeton, February 15, 2014. Historical Reflections on Parsi-Muslim Relations in Gujarat and Mumbai. Presented at the Muslims and Others Seminar, Princeton University, November 22, 2013. Constituting a Canon: Parsis, Philology, and the Public Sphere in Nineteenth-Century Bombay. Presented at the 42nd Annual Conference on South Asia, Madison, WI, October 20, 2013. Colonizing the Persianate: Epic and Empire in the Georgenāma of Mullā Fīrūz. Presented at the Association for the Study of Persianate Societies Conference, Sarajevo, September 4, 2013. Cyrus, Human Rights, and the Politics of the Past in Iran. 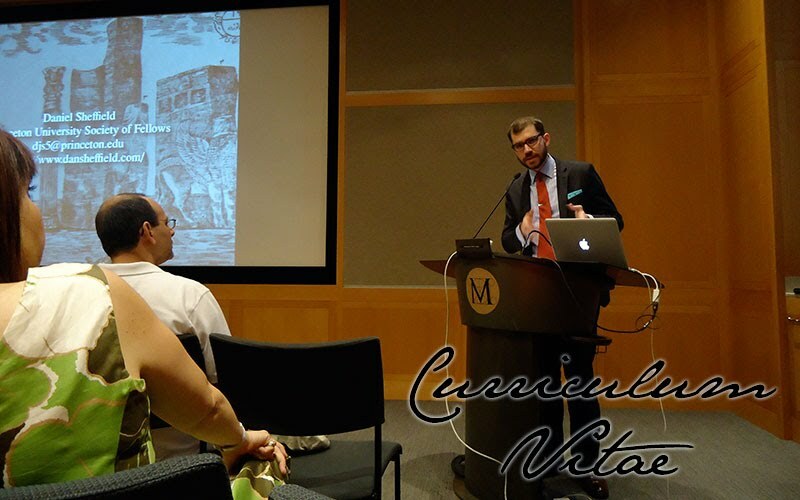 Presented at the Metropolitan Museum of Art, New York, July 21, 2013. Disenchanting the Dēn: Parsi Reactions to Paine and Voltaire.Presented at the 2013 Association for Asian Studies Conference, San Diego, CA, March 23, 2013. The Language of Heaven in Safavid Iran: The Linguistic Philosophy of Āzar Kayvān and His Followers. Presented at the 223rd Meeting of the American Oriental Society, Portland, OR, March 15, 2013. The Loss of the Persianate and the Recovery of the Iranian: On Parsi Antiquarianism and the Genealogy of Modernity. Presented at Celebrating a Treasure: 140 Years at the First Dastoor Meherjirana Library, Navsari. Navsari, Gujarat, January 14, 2013. The Mixing of Cultures (Āmīzish-i Farhang): Zarathustra, the Āzar Kayvān School, and the Boundaries of Zoroastrian Orthodoxy. Presented at the Institute of Advanced Study Middle East Seminar, Princeton, NJ, November 28, 2012. A Semblance of a Book: A Safavid Debate on the Prophethood of Zarathustra. Presented at the 222nd Meeting of the American Oriental Society, Boston, MA, March 17, 2012. Researching Life History in Mumbai. Presented at Shreemati Nathibai Damodar Thackersey (SNDT) Women's University, Mumbai, January 21, 2012. Mulla Feroz (1758-1830): The Life of an Early Bombay Parsi Priest between Indo-Persianate Tradition and British Colonialism. Presented at the K. R. Cama Oriental Institute, Mumbai, January 20, 2012. Missionaries, Miracles, and Modernity: Parsi Responses to Protestant Proselytization, 1830-1850. Presented at the 40th Annual Conference on South Asia, Madison, WI, October 21, 2011. Of Parsis and Philologists: German Orientalists and Zoroastrian Reformers in 19th century Bombay. Presented at Rethinking Religion in India III, Pardubice, October 13, 2011. Esoteric Exegesis of Avestan Passages in the Pahlavi Wizirgerd ī Dēnīg. Presented at the 7th European Conference of Iranian Studies, Krakow, September 8, 2011. Contesting Calendars, Connecting Communities: Collective Memory in Early Modern Zoroastrianism. Presented at the 15th North American Zoroastrian Congress, Houston, TX, December 29, 2010. This Town Isn’t Big Enough for the Two of Us: Struggles for the High Priestship of Bombay, 1830-1900. Presented at the 39th Annual Conference on South Asia, Madison WI, October 16, 2010. Calendar Controversies: Collective Memory and Communal Authority in Early Modern Zoroastrianism. Presented at the Eighth Biennial Iranian Studies Conference, Los Angeles, May 29, 2010. The Curious History of the Pahlavi Wizirgerd ī Dēnīg: Questions of Priestly Authority and Textual Legitimacy in 19th-Century Bombay. Presented at the Zoroastrian Trust Funds of Europe, April 11, 2010. Between Masnavī and Kāvya: The Zartośtnāmũ of Mobed Rustam Peśotan Hormazyār and the Rise of Parsi Gujarati Literature. Presented at the Gujarat Studies Association 2010 Conference, April 10, 2010. Iran, the Mark of Paradise or the Land of Ruin? Approaches to Reading Two Parsi Zoroastrian Travelogues. Presented at the Middle East Studies Association 2009 International Meeting, Boston, November 21-24, 2009. Manuscript Evidence for a Text with No Manuscripts: On the Sources of the Pahlavi Wizirgerd ī Dēnīg. Presented at the “Poets, Priests, Scribes and (e-)Librarians. The Transmission of Holy Wisdom in Zoroastrianism” Conference, Salamanca, September 2-5, 2009. The Beginnings Of Iranian Philology In Europe And India: The Quest for the Historical Zarathustra. Presented at the K. R. Cama Oriental Institute, Bombay, February 20, 2009. Invited participant in the “Cosmopolitan Encounters Between Early Modern Sanskrit and Persianate Cultures” workshop, Toronto, July 31-August 3, 2008. Between Dēn and Dharma: Indian Zoroastrian Texts from the Medieval and Early Modern Periods. Presented at the 7th Biennial Iranian Studies Conference, Toronto, August 2, 2008. Mullā Fīrūz: A Parsi Priest at the Nexus of Zoroastrian Tradition, Indo-Persian Culture and British Colonialism. Presented at the “Zoroastrians Past and Present” Conference at the Ancient Iran and India Trust, Cambridge, UK, June 7, 2008. Marvelous Journeys to the Land of the Sagsārān: Questions of Genre and Register in Classical Persian Literature. Presented at the 218th Meeting of the American Oriental Society, Chicago, March 17, 2008. The Position of Zarātushtnāma in the Transmission of the Sacred Narrative of the Prophet Zaraθuštra. Presented at the 6th European Conference of Iranian Studies, Vienna, September 20, 2007. Co-organizer of Celebrating a Treasure: 140 Years at the First Dastoor Meherjirana Library, Navsari. January 12-15, 2013, Navsari, Gujarat, India, the first scholarly conference on Iranian and Parsi Studies in Navsari, with more than forty speakers from North America, Europe, and Asia. Advisor, Sharmin and Bijan Mossavar-Rahmani Center for Iran and Persian Gulf Studies, Princeton University. Peer Reviewer, Journal of the American Oriental Society. Peer Reviewer, Iran: Journal of the British Institute of Persian Studies. Peer Reviewer, Journal of the Royal Asiatic Society. Council Member, International Society for Iranian Studies, 2007-2009.